Centaurus is a constellation in the southern hemisphere of the night sky. It is named after a centaur, which is a creature that is half man and half horse. 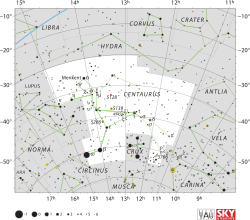 The astronomer named Ptolemy listed Centaurus when he made a list of 48 constellations. Centaurus is also one of the 88 constellations that were made by the International Astronomical Union. In the direction of Centaurus is the Shapley Supercluster or Shapley Concentration (SCl 124). This is the largest concentration of galaxies in our nearby universe. This page was last changed on 11 April 2018, at 13:43.